With WooCommerce Order Min/Max Quantities module you can set minimal and/or maximal item quantities for orders. Quantities can be set for all order (i.e. cart total quantity) or on per item basis. When setting minimum quantity requirements for the order you can require minimal quantity for the whole cart (Cart Total Quantity) and/or minimal quantity for each item in cart (Per Item Quantity). If you don’t need any of these options, just set its value to zero. In this section you can also set messages visible to the customers if minimal quantity requirements are not met. Section is similar to the minimum quantity section, but instead maximum order quantity requirements are applied to the cart. There are two more general options. With Enable Cart Notices option you can enable or disable wrong quantity messages on WooCommerce cart page. If notices on cart are disabled, customer will only see notices on the checkout page. With Stop Customer from Seeing Checkout on Wrong Quantities you can restrict user from viewing the checkout page if order quantity requirements are not met – in this case user will be redirected to the cart page if he tries to access the checkout page. With this option enabled, you probably want to enable cart notices, so customer would have the information on why he is not allowed to get to the checkout page. Thanks for providing “WooCommerce Order Min/Max Quantities” feature. It works but appears to me that it can only be applied globally (store-wide). I would like to enable different min/max values and messages for different products. Hi! Is there a “group quantity” at product level? It is not working = it is showing nim order quatity on add to cart button, but after pressing add to cart only one product goes into the cart. 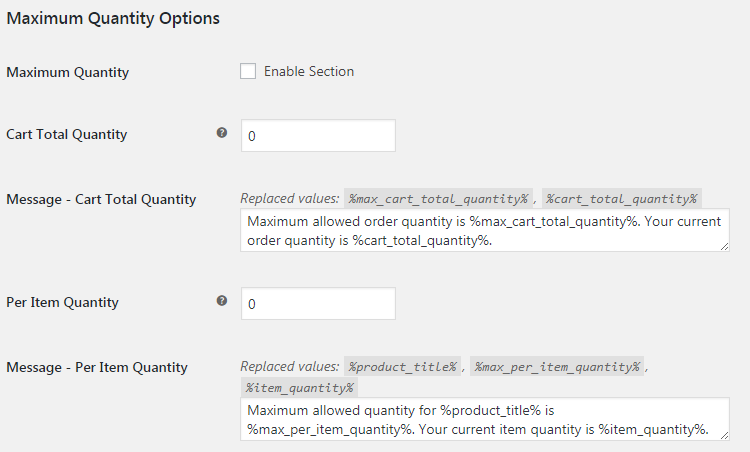 Are you sure you have enabled the module, option “Minimum Quantity”, and have set the “Per Item Quantity” to something higher than 0, or enabled “Per Item Quantity on Per Product Basis” and have set product option to something higher than 0? If so, can you contact us at support@booster.io? same here, is this resolve yet? 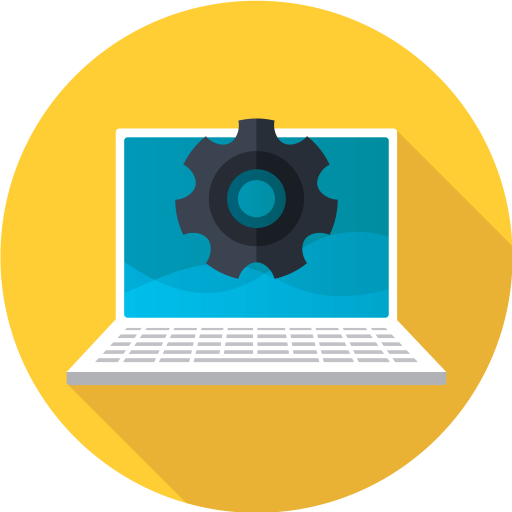 Please contact us directly at support@booster.io. Thank you. Pro plugin user. I actually opened a ticket (2361) about 4 weeks ago. You guys are usually much better at response than this. I am getting an error based on the following process. – Setting Min/Max to ‘1’ globally. – Per Item Quantity on Per Product Basis enabled. – Setting Product A to ‘-1’ individually. If I set individual Product specific M/M as ‘0’ (eg. use global) checkout proceeds as expected. Hi, I’m interested in the min/max order quantities feature, and I’m wondering if the quantity field in product page shows the minimum quantity as default. For example, if I set the min qty as 5, the qty field (product page) show 5 as default and cannot be decreased in value. That is correct. It will show 5 by default and will not allow decreasing the value. its possible to control the min. qty by product level? Yes, that is possible. 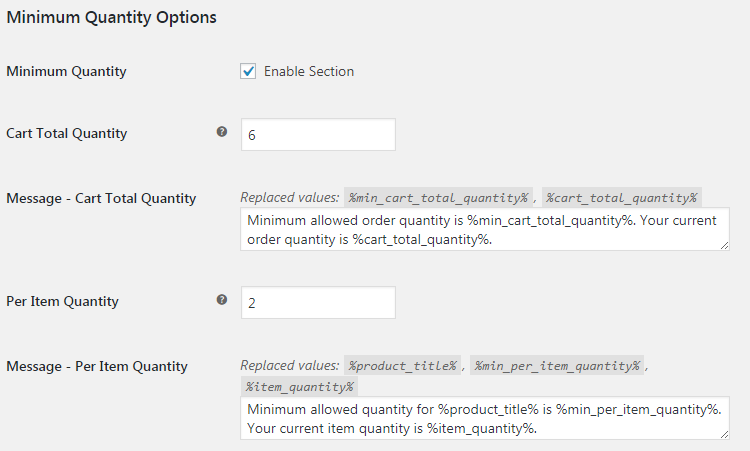 Simply enable “Per Item Quantity on Per Product Basis” option in the module settings and you will be able to set that in the product edit pages.